Ketorolac tromethamine, a nonsteroidal anti-inflammatory drug (NSAID), is indicated for the short-term (up to 5 days in adults), management of moderately severe acute pain that requires analgesia at the opioid level. Oral ketorolac tromethamine is indicated only as continuation treatment following IV or IM dosing of ketorolac tromethamine, if necessary. The total combined duration of use of oral ketorolac tromethamine and ketorolac tromethamine injection should not exceed 5 days. Ketorolac tromethamine is not indicated for use in pediatric patients and it is NOT indicated for minor or chronic painful conditions. Increasing the dose of ketorolac tromethamine beyond the label recommendations will not provide better efficacy but will increase the risk of developing serious adverse events. Nonsteroidal anti-inflammatory drugs (NSAIDs) can cause an increased risk of serious cardiovascular thrombotic events, including myocardial infarction and stroke, which can be fatal. This risk may occur early in treatment and may increase with duration of use (see WARNINGS and PRECAUTIONS). Ketorolac tromethamine is CONTRAINDICATED in the setting of coronary artery bypass graft (CABG) surgery (see CONTRAINDICATIONS and WARNINGS). Hypersensitivity reactions, ranging from bronchospasm to anaphylactic shock, have occurred and appropriate counteractive measures must be available when administering the first dose of ketorolac tromethamine injection (see CONTRAINDICATIONS and WARNINGS). Ketorolac tromethamine is CONTRAINDICATED in patients with previously demonstrated hypersensitivity to ketorolac tromethamine or allergic manifestations to aspirin or other nonsteroidal anti-inflammatory drugs (NSAIDs). 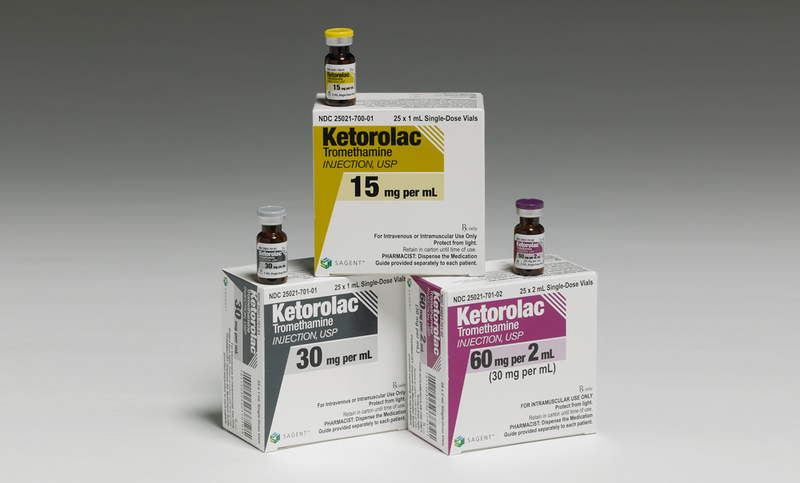 The use of ketorolac tromethamine in labor and delivery is CONTRAINDICATED because it may adversely affect fetal circulation and inhibit uterine contractions. Dosage should be adjusted for patients 65 years or older, for patients under 50 kg (110 lbs.) of body weight (see DOSAGE AND ADMINISTRATION) and for patients with moderately elevated serum creatinine (see WARNINGS). Doses of ketorolac tromethamine injection are not to exceed 60 mg (total dose per day) in these patients. Ketorolac tromethamine tablets are indicated only as continuation therapy to ketorolac tromethamine injection, and the combined duration of use of ketorolac tromethamine injection and ketorolac tromethamine tablets is not to exceed 5 (five) days, because of the increased risk of serious adverse events. The recommended total daily dose of ketorolac tromethamine tablets (maximum 40 mg) is significantly lower than for ketorolac tromethamine injection (maximum 120 mg) (see DOSAGE AND ADMINISTRATION).